Based in Bordeaux, the Cuveliers are a longstanding family of négociants that eventually acquired three local estates, the best-known of which is Léoville Poyferré. 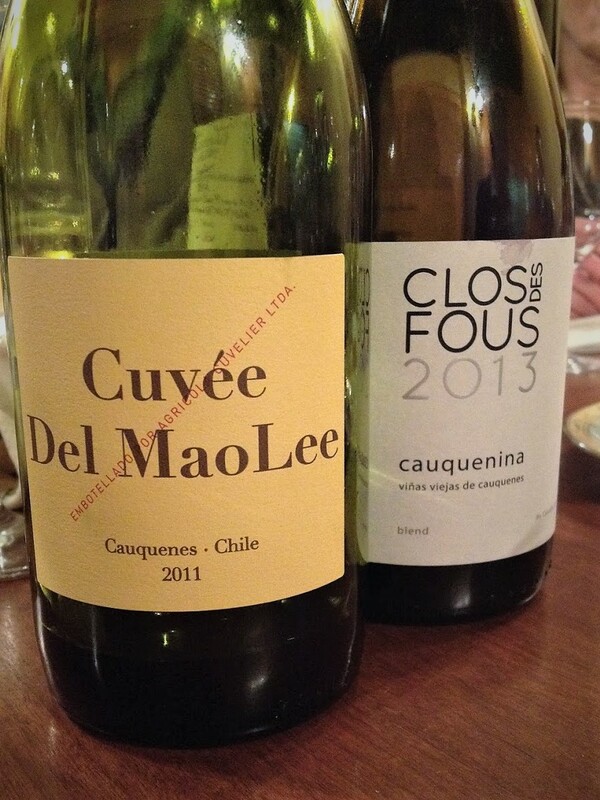 In the late 1990s, they founded a family-owned estate in Argentina, Cuvelier Los Andes. After obtaining a wine-growing degree in 2007, scion Baptiste travelled to Chile to work with his friend Louis-Antoine Luyt, who introduced him to the Cauquenes region of the Maule Valley. He soon realized he could make there a red complementary to the family’s Argentinian reds, the Cuvée del Maule, the first vintage of which was the 2009. (Haven’t run across an explanation as to why Maule is written MaoLee on the label – interference from the appellation authorities perhaps? – but that’s the only place I see it spelled thus.) The 2011 is a blend of Cabernet Sauvignon (42%), Carignan (30%), Pais (8%), Carmenère (8%), Cinsault (7%) and Merlot (5%) from organically dry-farmed, fair-trade grapes grown under contract. Cuvelier provided viticultural advice to the growers and had the fruit harvested by his team. Most of the Cabernet was destemmed, given four to six days cold maceration and fermented in temperature-controlled (24°C) tanks with pump-overs early on. The Camenère, Carignan and Pais were fermented using carbonic maceration. The Cinsault, Merlot and remaining Cabernet were fermented in small open tanks with punch-downs early on and manually pressed before fermentation ended. The wines were transferred to fourth- and fifth-fill French oak barrels for malolactic fermentation and maturation. All fermentations were spontaneous. Indeed, the only additive was a tiny amount (35 mg/L) of sulphur dioxide at bottling. 14% ABV. Quebec agent: Ward & associés. Per the agent, a blend of Carignan (36%), Syrah (23%), Carmenère (23%) and Malbec (18%); some commenters also claim Pais and Portugais Bleu are present. In any case, the grapes came from purchased, dry-farmed, organically grown old vines in the Itata Valley. Fermented in concrete tanks using indigenous yeasts “when possible.” A fraction of the wine was matured in new French oak barrels, the rest in second-fill barrels. 13.5% ABV. Quebec agent: Réserve & Sélection/Trialto.